Home › College Tuition › Free McCollege for All! The following has been reprinted from The American Spectator, written by Daniel J. Flynn. 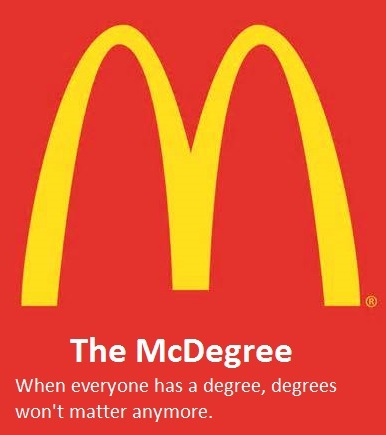 This article captures the key problems with creating the McDegree’s that Obama is so keen on providing, at your expense of course. I myself attended a two-year community college prior to transferring to a four-year university and completing my degree, a degree that actually translates to significant opportunities. I could not afford a four year school, and the local community college was affordable enough, even on my minimum wage salary, that I was able to do this. Working through school and paying out of my own pocket incentivized me to pick a degree that actually leads to a job, to show up for classes, to study, to pass, to move forward. What will free do? Free will be abused. Free will drive up tuitions. Free will overcrowd schools. Free will lower quality. Free will require Government oversight and regulation to make sure FREE is FAIR. Free will do all of the evil and vile things that free does to anything it is applied to. Which is why Governments loves FREE so much, only a little bit more than FAIR. President Obama offered in this week’s State of the Union address that too few young Americans attend community college. If only more twenty-somethings parlayed their GEDs into course work at Walla Walla Community College, judged the nation’s best by one account, then we might once again boast the most well-educated people on the planet. One need not possess a B.A. from Columbia and a J.D. from Harvard Law to harbor skepticism. About one in five community college students transfer to traditional four-year colleges. A little over half of those who do end up finishing their requirements within four years. Like the president’s health plan mandating coverage of 26-year-old “children” on their parents’ plans, free community college extends adolescence. More to the point, it misses the point. Access to subpar education won’t uplift intellects just as access to subpar insurance won’t make patients healthier. Credits here and there at commuter schools can help students avoid onerous tuition. But they can also divert people ill-suited to academia from getting on with their lives. The president wants more college students. He should want better colleges. Like printing money, printing more degrees undermines their worth. Making colleges universal rather than exclusive naturally compels a lowering of standards. Selectivity remains an advantage for colleges vis-à-vis most high schools. They bar admittance to those who haven’t demonstrated a capacity to excel in an academic setting and send home those whose grades fall beneath acceptable levels. Why curse colleges with what ails high schools? Ray Bradbury, whose oeuvre reads as a love letter to literature as much as it does to tattooed carnival ladies, smalltown America, and life on the Martian frontier, was once like those economically disadvantaged youngsters President Obama spoke about. Intellectually curious but financially bereft, the short-story writer traveled to the Los Angeles Public Library for three days a week after graduating high school. Education mattered to him. The piece of paper—not so much. President Obama appears to have these priorities backwards. The diploma now trumps the education. That devalues the paper. Credentialism masquerading as education acts as one drawback to universalizing college. Misunderstanding higher education as job training ranks as high on the list. Obtaining a job stands as benefit from a degree. But it isn’t the purpose. Apprenticeship and trade schools do a better job at training students for the workforce. A liberal arts education, which mission creep has marginalized, enables students to participate in self-governance—of their souls and in the broader polis. A byproduct of this broader education enables critical thinking skills useful in any number of professions. Specialized learning—a typing class in the 1950s or a course on DOS in the 1980s—soon becomes obsolete. The liberal arts don’t. The economics component of the president’s plan, like the education part of it, fails. In current dollars, the cost of college exceeded $9,000 a year a half century ago. Today, it exceeds $20,000 a year. The spike coincided with an unprecedented slew of financial-aid programs designed to make higher education more affordable. Instead, the subsidies allowed schools to increase tuition and other costs knowing that the government would make up the difference. Past evidence of the influence of subsidies on costs suggests a similar outcome here. Ultimately, providing an inferior product for free undercuts institutions that more effectively serve students. Surely if the president provided vouchers for free Happy Meals it would enable some who don’t eat much to eat more. But the primary effects would be to put out of business those who provide healthier fare and undermine the wellness of most of the voucher recipients.